U2, fast approaching forty years together as one of the more groundbreaking rock groups of the present generation, started in Dublin, Ireland in 1976. Initially consisting of six members but quickly pared down to four players—Adam Clayton (bass guitar), Larry Mullen, Jr. (drums and percussion), David Howell Evans, better known as “The Edge” (guitar, keyboards, and vocals), and Paul David Hewson, or “Bono,” (vocals and guitar)—the band has stuck together despite well publicized creative differences. In the process they released 13 albums and established themselves as one of the most popular and best-selling music artists of all time. On March 13 of this year Clayton will celebrate his 55th birthday, having been born in 1960. 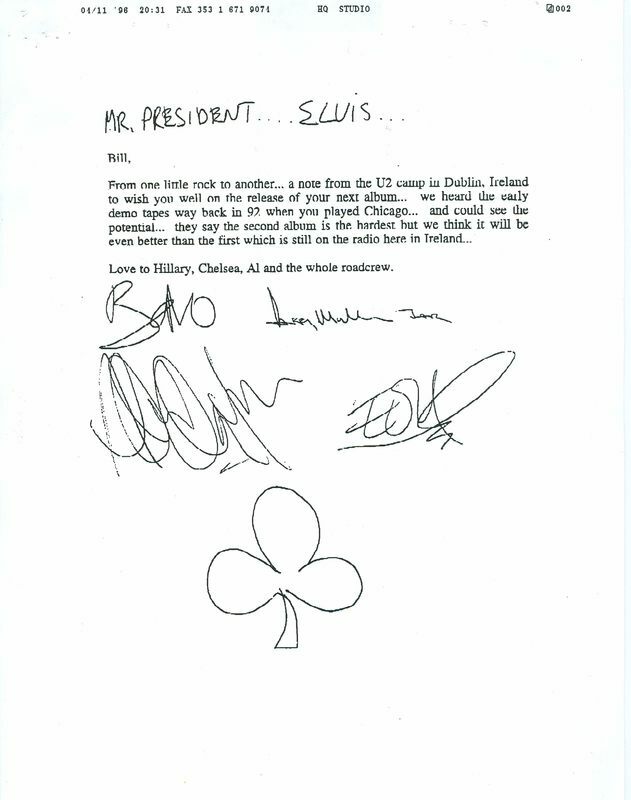 Also, U2 is obviously an Irish band; Bill Clinton often speaks fondly of his Irish-American heritage. Moreover, St. Patrick’s Day (March 17) is widely recognized by Americans and celebrated in an enthusiastic fashion. 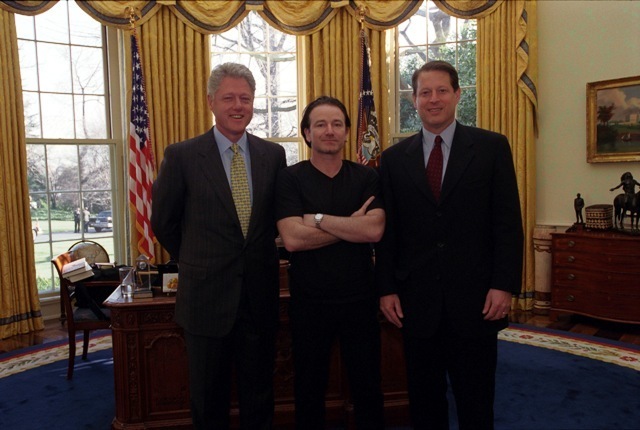 The three photos shown focus equally on U2 and President Clinton. In the first photo the full band is featured (along with longtime manager Paul McGuinness) standing behind the Chief Executive. Taken on May 26, 1997, the picture coincided with U2’s appearance that night at RFK Stadium during their elaborately staged “PopMart” tour. 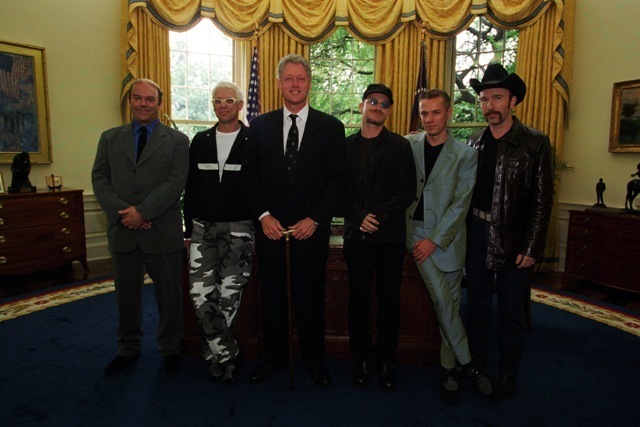 The other two photos show President Clinton meeting with Bono and President Clinton and Vice President Gore alongside Bono, respectively. 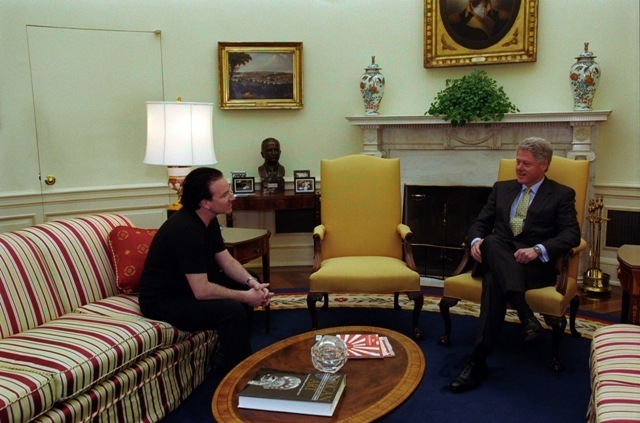 The photos were taken in the White House in March 1999. 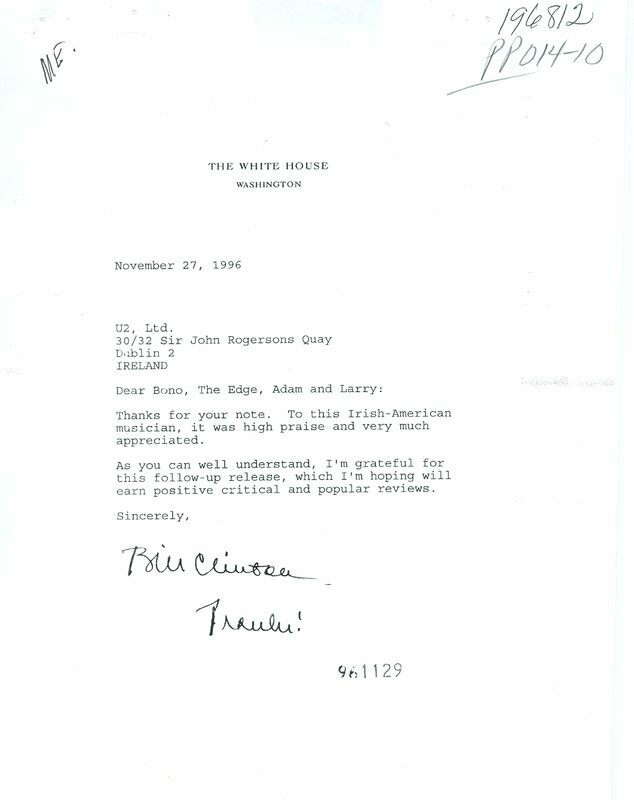 The documents are courtesy of the Archival Department of the Clinton Presidential Library and Museum. 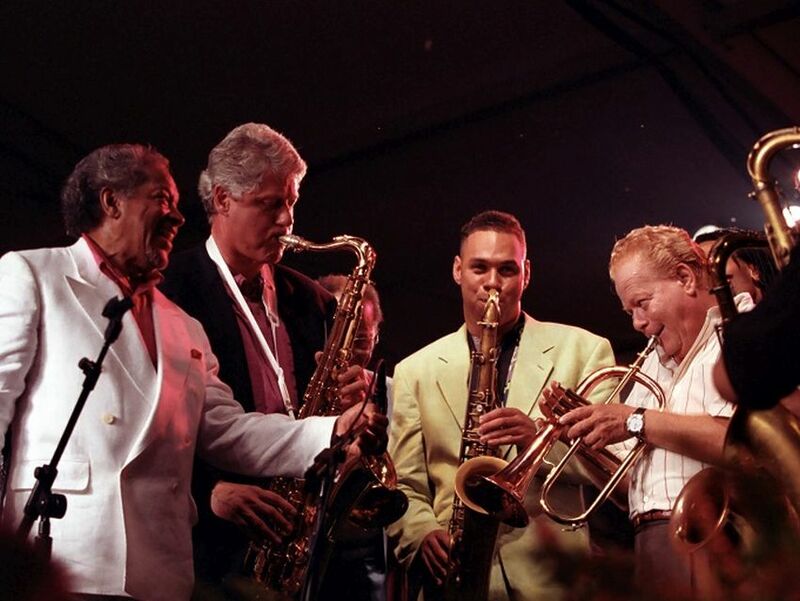 The photos are courtesy of the Audiovisual Department of the Clinton Presidential Library and Museum.